Polyether materials are used to get very accurate impressions mostly during procedures for dental restorations. There are many different brands and techniques available on the market. 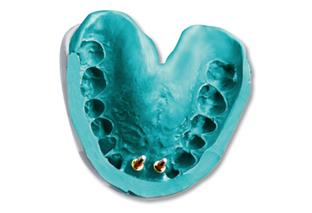 Restorations such as crowns, bridges, inlays, and onlays require very precise impressions. That way the dentist and dental technician will be able to produce ideal restorations that perfectly fit in the patient’s mouth. The most common uses of polyether impression materials are for the construction of partial and total dentures, the preparation for crowns and bridges, and to take an impression of the cavity for inlay and onlay. Polyether materials are packed in two pastes. The first one is base and contains pre polymer ethylene amine, plasticizer, inner filler. The second one is catalyst paste that includes ester derivatives of aromatic sulphonic acid, plasticizer, thinner and methylcellulose. The mixing time is 35 seconds and the setting time is 5 to 6 minutes. The polyether impressions are the most hydrophilic elastomeric impressions out there. Dentists don’t need any special equipment for these materials. If used properly they are very dimensionally stable. Can be poured more than once. Very acceptable by the patients because of the nice smell. Polyether materials have a good accuracy and tear resistance. These materials are very stiff and come in only one viscosity. That is why dentists and dental technician use wax to fill in some deep undercuts. They also set very quickly and the manipulation has to be fast and effective.